Simon Wright, Nathan Priddy, and Dainan Swoope will all be transferring out of the program. Yikes! That’s in addition to the graduation of Santa Ana and Sebring. Elon, officially welcome to the preseason cellar. Surprised that Elon hasn’t parted ways with Matheny yet. Elon has had no success since joining the CAA. They haven’t even won a CAA tournament game. Per Jeff Goodman, Justin Pierce of W&M will graduate and transfer. (03-15-2019 05:59 PM)Seahawk2010 Wrote: Yikes! That’s in addition to the graduation of Santa Ana and Sebring. Elon, officially welcome to the preseason cellar. Elon has always reminded me of W&M Lite. Most at W&M were shocked about Shaver not having his contract renewed. He is extremely well respected and would be an awesome hire if Elon was looking to make a change. A possible grad transfer to keep any eye on is Derrik Smits from Valparaiso. Yes, he's the son of former NBA player Rik Smits. The reason I'm posting him as a possible option is because of his connection with Jackie Manuel. Manuel already snagged Linnsen from Valpo, and Smits would be an even bigger get (literally/figuratively) Smits will probably get P5 looks because he posted some good stats for a 7 footer, but I imagine he's also looking for more playing time. He only averaged 21.8 minutes per game at Valpo... Might be out of our league but he's someone to keep an eye on as we look for Grad Transfer bigs. It’s not really surprising, but would still like to see some source data. Not shocking. Seemed like there was some manner of problem towards the end of the season- suspension, lack of playing time. One other thought - with Fornes leaving, that leaves just Ty Taylor from the Keatts era does it not? 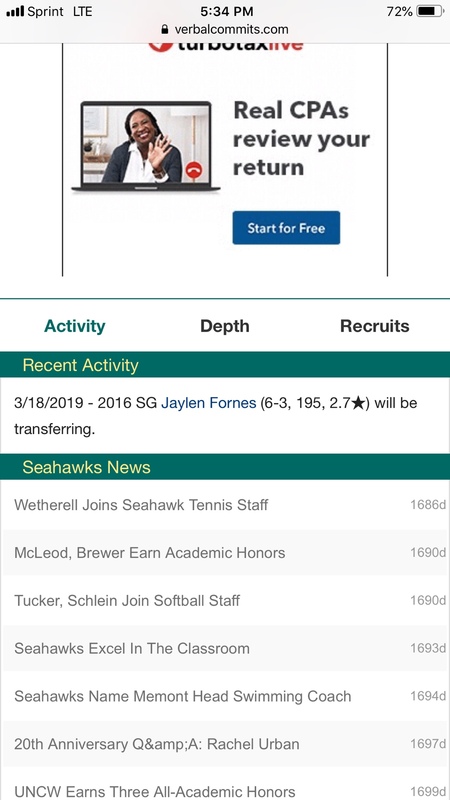 (03-18-2019 05:09 PM)Proff Wrote: One other thought - with Fornes leaving, that leaves just Ty Taylor from the Keatts era does it not? Yep... I was hopeful that Fornes would come back and try to earn his starting job back, but it seems like this will probably benefit both sides. He can go somewhere that fits him better, McGrath can go forward with his guys. I would assume Taylor will go as well, hopefully that will be it for us and transfers out of the program. Ty Taylor just tweeted that he will go the Grad Transfer route. No surprise here, this will be a team with all McGrath recruits going forward. I really doubt Taylor leaves. I may be wrong, but I can’t imagine he’d want to transfer and sit again for eligibility. Just can’t picture it. Best of luck to Fornes going forward. Interested to see if he’s done enough to garner P5 interest or if he laterals to another mid major. He’d be a solid get for Wes Miller’s program and that would keep him in state near home. (03-18-2019 05:28 PM)Gary Miller Wrote: Ty Taylor just tweeted that he will go the Grad Transfer route. No surprise here, this will be a team with all McGrath recruits going forward. Welp. There we have it. I was wrong. Must have been some team meetings today considering they both announced it today. If Ty goes as a grad transfer, he will not have to sit out a year.